I first met Rashida Murphy when we were both featured on Amanda Curtin's blog as WA Writers to watch. Not long after this, Rashida's book, which she had been working on as part of her PhD, was accepted for publication by UWA Publishing. 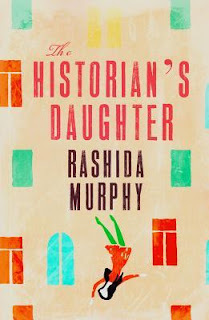 The Historian's Daughter came out in September of this year, and I was so excited to read it. The Historian's Daughter is the story of Hannah, a young girl growing up in India with a colonialist father whom she calls the Historian, and a Persian mother whom she adores, and calls the Magician. She idolises her older sister Gloria, loves to read about 'the conquistadors', Englishmen who travelled to the Indian colony, and collects words. Hannah's family life is crowded and not always satisfying to her, with numerous Aunties living under their roof such as Meher Aunty who is a greedy and selfish presence in Hannah's life, and the mysterious Aunt Rani, her father's only sister, who is locked in an attic room due to her unsound mental state. She has a difficult relationship with her father, who is secretive and cold towards his children, and as she grows older, her relationship with her mother is strained by the Magician's increasing distance. When Sohrab, the son of a Persian friend of the family, comes to live with them, the Magician spends increasing amounts of time with Sohrab, speaking to him in Farsi. Then, one day, the Magician disappears. Not long after that, Gloria too leaves home. The Historian moves the family to Australia, where Hannah must navigate a new way of being in the world at the same time as she is growing into a young woman, all the while, missing her mother and sister. It is hard to do justice to this beautiful novel, as the story is like a rich tapestry, with many different elements weaving together over time. Hannah, the narrator, has an authentic, trustworthy voice, and seeing the world through her eyes felt comfortable, while at the same time, unfamiliar. I felt her deep love for her older sister, as well as the rivalry between the two girls, as this is a novel which is just as much about family ties as it is about Hannah navigating her own identity. The book is told in scenes which sometimes jump around through different points in the timeline, but Murphy's writing is so assured that I never once felt lost; I always had faith that the narrative would begin to make sense if I kept reading. I was particularly taken with the descriptions of local scenery, such as King's Park, for their gentle clarity of description which never felt heavy-handed. In the best possible way, I felt like this novel was harking back to stories which had come before it, like it was a literary tribute to the books which had shaped the author's and perhaps even the character's point of view. While I think that to say a book is like a pure amalgamation of other books isn't strictly accurate, I would say that at different points in time, the book reminded me of Jane Eyre, the work of Gabriel Garcia Marquez and The People Smuggler. Yet at the same time, The Historian's Daughter is an entirely new and original work which is filled with a sense of its author's love for language and story, and this spoke to me. Rashida Murphy represents a new voice on the Australian literary scene, and a very skilled one at that. I look forward to seeing what she will write for us next.